I don't jump out of bed every day at 6:00 am when that alarm blares happy to meet the day. Some days, I wake up at the sound of that alarm and start complaining instantly--I'm tired; I don't want to get up; this is the longest week ever; I need coffee; ugh, I thought today was Friday (when it's Tuesday). The list goes on; I'm sure Ian knows the complaints well. He's no angel in the morning, but I definitely win the award for most grievances spewed from 6:00am until 6:05am on a Monday morning. But on safari, it's completely different. Ernest Hemingway, not exactly known as being the happiest man alive, is quoted as saying "I never knew of a morning in Africa when I woke up and was not happy." The same is true for me. On safari, they wake you up as early as 5:00am. Waking me up at 5:00am should be cause enough to bring on a slew of protests, but it doesn't. Instead, I can't wait to get up. Often, I'm up before the wake up call (some of that may be jet lag . . .). On safari, you don't know what the day will bring, what you will see--the possibilities are endless. But what you know for sure, is that whatever it is, it will be amazing, and sometimes even life altering. Super big, happy smiles on safari at the Forest Lodge in Phinda. Though I could have started a number of blog posts about the places I've been to in southern Africa with those first two paragraphs, the 5 nights and 6 days we spent at the &Beyond Forest Lodge in the Phinda Private Game Reserve is Exhibit A (give me a break, I am a lawyer most days) in support of my being happy, often down right giddy, every day I wake up in Africa on safari. Our amazing experiences at Phinda were so numerous, I need two blog posts to cover them (the second to follow). Phinda is located near the Indian Ocean in northern KwaZulu-Natal in South Africa (see www.andbeyond.com). The game reserve contains 7 distinct ecosystems, including a sand forest, savanna, and wetlands. According to &Beyond's Eco Guide, the sand forest is a "distinctive, species-rich, dry forest, that grows on deep grey sands, the fossil dunes of an earlier coastline." We stayed in the Forest Lodge located in the sand forest. Each room is its own "glass house" in the sand forest. I've never stayed in or seen anything like it. It was luxurious, peaceful, and secluded as your "house" is surrounded by towering trees. Though we loved the many details and comforts of the room, what we enjoyed most was the spacious outdoor deck with large, outdoor couches that were great for napping on and relaxing mid-day as wart hogs, red duiker (a small stocky antelope), nyala (a large antelope with distinctive markings), and even a leopard walked by (we may not have been so relaxed upon seeing the leopard . . .). It probably didn't hurt that the fully stocked bar was located on the deck! 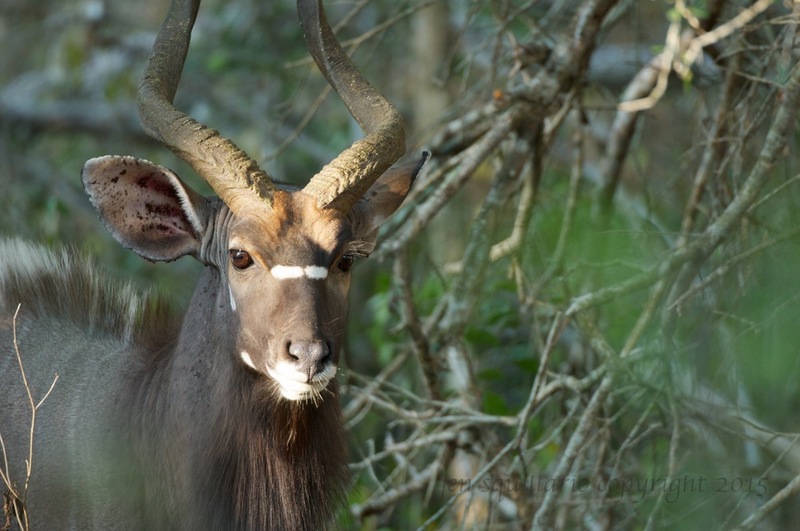 Two photos of nyala to scroll through. Our stay at Phinda was accented by our terrific guide, Giles, and our wonderful tracker, Able. Though we have been lucky in our travels to have mostly good guides and trackers, they are not all of equal quality. And, the quality of guide/tracker can impact the quality of your safari. There are many attributes that make up a good guide and tracker team, but three of the most important are knowledge, professionalism, and communication with the guests. Giles and Able exhibited all three, and I don't believe our trip would have been as good had they had not been our guide/tracker team. Day 1. Our first drive, an evening drive, started with a bang--a cheetah. 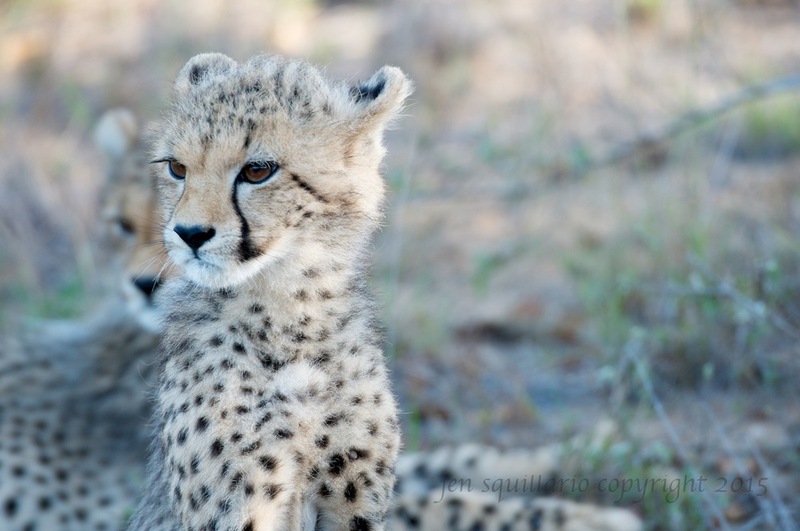 Little did I know this would be the first, and not the best, of many cheetah sightings at Phinda. 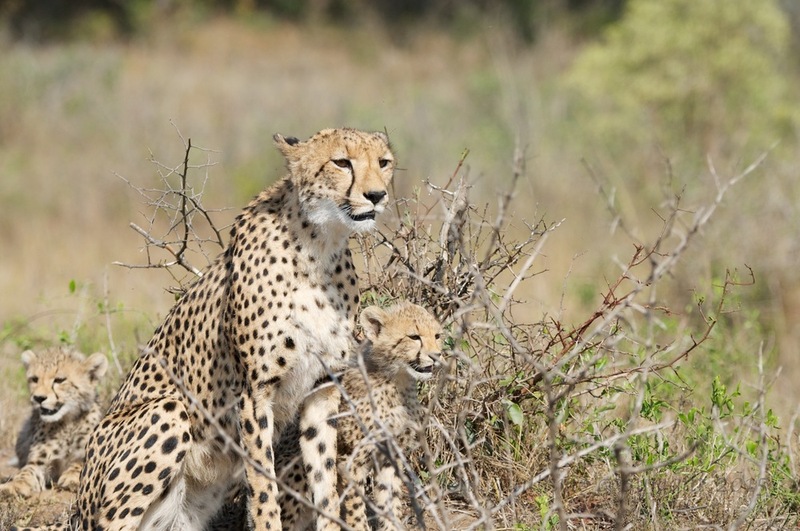 In the over 10 trips, we've made to southern Africa, we had only seen cheetah on 3 occasions prior to this trip. So, seeing one on our first drive was cause to be excited. Our first cheetah sighting, a female, was close to the lodge. She was lying in the tall grass as the sun set. Day 2. The second day started with a pride of lions munching on a carcass (I'll spare you those photos) and the King looking full and satisfied. A full lion with a bit of leftovers on his chin. Throughout the day, the leopard entertained the lodge guests by walking back and forth from its hiding place to the waterhole. And, our day was topped off with sleeping lions and a surprise champagne happy hour in the bush. Smiles all around! Day 4. Day 4 was marked by tracking cheetah followed by another amazing cheetah sighting, a leopard visit, and beautiful, sweeping views of the reserve (my photos of which do not do it justice). The view from the truck of Able (facing truck) and Giles (facing away from the truck) checking for tracks of the cheetah. 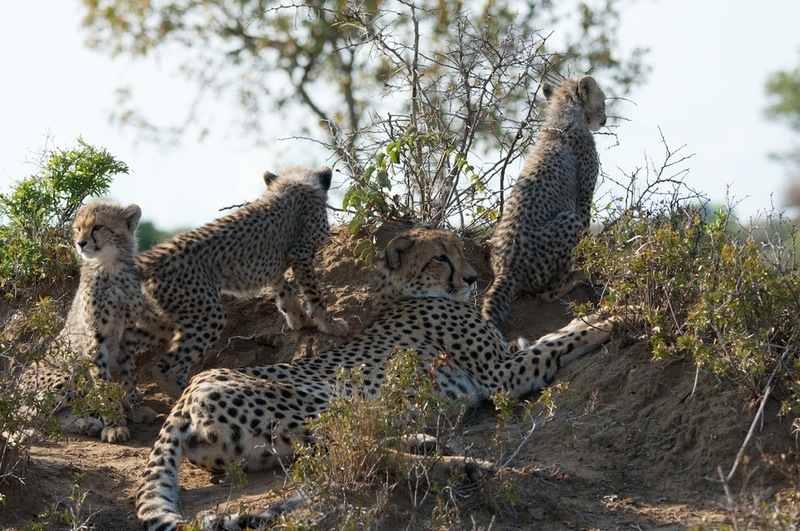 Giles and Able tracked the female cheetah and her four cubs. First, they found what was left of their meal, and then they located the cheetah (photos to scroll through). After a wonderful morning with cheetah, Giles took us on a walk through the sand forest where the leopard who had been hanging out at the lodge's water hole had last been seen. When Giles said "do you want to look for that leopard," we didn't hesitate with a "yes." We didn't see the leopard, but it was exciting to know that he had been near where we were walking. After picking up an iced tea back at the lodge post walk, we went back to our glass house room, and as we walked up the steps to the deck, Ian said a bit loudly, "what is that!?" And, I responded not as coolly as I would have hoped, "leopard." I think the leopard was more freaked out by us than us by him. He gave us a look and sauntered off into the forest. It never occurred to me to pick up my camera; I was too in the moment; too enthralled with being on ground level with a leopard, meeting him eye to eye, and thinking of nothing else but what was happening in that moment. Karen Blixen, author of Out of Africa, described being on safari: "There is something about safari life that makes you forget all your sorrows and feel as if you had drunk half a bottle of champagne - bubbling over with heartfelt gratitude for being alive." It's true, I may have drunk a half of bottle of champagne (and possibly more) on this safari, but I felt bubbly with life from the moment I woke up every morning. It's a feeling I wish I could bottle and bring home with me. So far, the best I've been able to manage is to bring home my memories reinforced by our photos. Often, this is enough. After a not so perfect day or moment in time, it's these memories that bring a smile to my face. 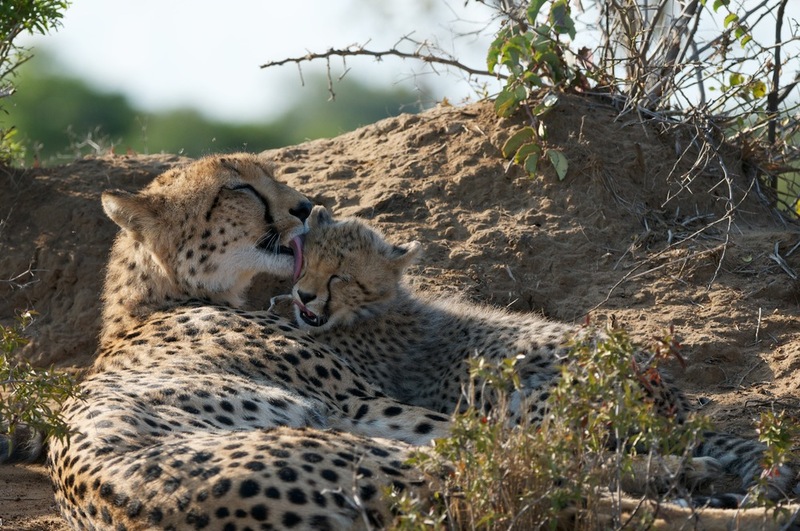 On Safari: Phinda Private Game Reserve Part II Coming Soon!